Greetings! We’re GoBE Campers and we’re glad you found us. Like many people, we love tent camping, but we don’t love sleeping on the ground. We enjoy campfires, nights under the stars, and spending time in nature. With simplicity in mind, we started GoBE Campers. We set out to create a lightweight camper that is easy to maintain, ultra-functional and has maximum storage options. GoBE Campers are designed to be taken where you want to go, whether that is cruising down the highway or taking it off the pavement. With ideas born in Iowa, and brought to life in Colorado, we are proud to say that our campers are built in the U.S.A. We are just getting started and look forward to sharing GoBE with you! If you are looking for a no-nonsense camping trailer that is built with quality components and attention to detail, you have come to the right place. We are eliminating the things you don’t need and focusing on simplicity, functionality, and comfort.  The GoBE is designed to be rugged, dependable, and easy to maintain for decades to come. 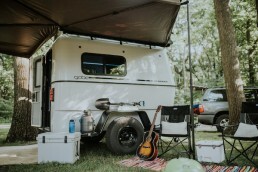 Our overbuilt steel-tube frame, high ground clearance, and rugged tires will give you the flexibility to take your GoBE Camper on or off the pavement. Our narrow footprint provides the visibility to cruise down the highway with confidence, park easily, and maneuver winding mountain roads. GoBE campers are designed to give you maximum storage in a small space. Not only is the interior lined with high quality cabinets, but we also provide versatile exterior storage options. The GoBE comes standard with a heavy-duty cargo box, full-size roof rack, and an exterior cargo skeleton that maximizes storage options. The GoBE is both comfortable and fun. 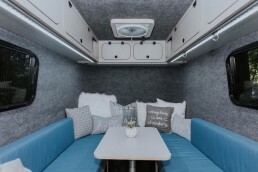 The interior is lined with bench seating that converts into a plush queen sized bed. Color changing LED lights bring a fun element to the GoBE, allowing you create the mood and ambiance that you want. Our reversible ten-speed fan, with rain guard, will keep you cool and comfortable in warm weather. Our custom cabinets maximize your overhead storage and give a built-in modern look. We use an 18mm baltic birch core with a high-pressure laminate on both the front and back face to give you a true balanced panel. This will prevent warping and be extremely easy to maintain. We build our lightweight campers with high quality components and excellent craftsmanship. We aim to provide years of stress free use with our attention to detail and emphasis on durability. The reinforced fiberglass shell is easy to maintain and built to last. 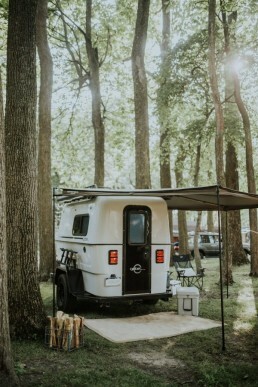 Our two-piece fiberglass body eliminates worries about leaking or rotting that many other campers experience as they age, giving you peace of mind for years to come. Please select the options you would like on your camper. Standard options have been pre-selected. All prices INCLUDE installation. Many options have no price because there are many variables to take into consideration. Please contact us about any additional accessory needs you have. We are an authorized dealer for the following brands: THULE, Front Runner Outfitters, ENGEL Coolers, Roadshower, Zamp Solar. We are here to help you build a camper that suits your specific needs. We can outfit your GoBE or we can offer advice if you wish to outfit your own camper. Thank you for visiting GoBE Campers! If you would like more information, please fill out the form below or give us a call. We look forward to hearing from you. Happy camping!